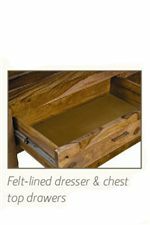 Meshing rustic, natural-looking furniture with minimalist lines and sleek metal hardware, this dresser has a distinctive look that is the perfect contrast to mission or contemporary design. Natural swirls and knots in the solid Sheesham wood give this dresser its striking, textured look. Six drawers, the top of which is lined with felt to help keep jewelry and accessories in place, provide much needed bedroom storage. 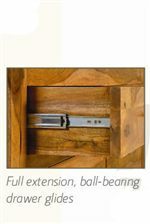 Dovetailed drawers with metal, full-extension glides ensure your furniture will be manageable and functional for years to come. The Atria Contemporary Six Drawer Solid Wood Dresser by Modus International at A1 Furniture & Mattress in the Madison, WI area. Product availability may vary. Contact us for the most current availability on this product. Nature-inspired style has come back in a big way, and what better way to incorporate it into your decor then with this minimalist, contemporary furniture worked in rustic, knotty hardwood. The Atria collection is made of beautiful and distinctive plainsawn lumber, owing its unique grain appearance to time and the elements. This collection's Sheesham, or Indian rosewood, body is sourced from sustainable, government-managed plantations, so you know that you're making the right choice for your home and the world you live in. The exceptionally stylish Atria bedroom features an understated style and useful necessities like dovetailed drawers and metal, full-extension drawer glides for easy use. The Atria collection is a great option if you are looking for Contemporary Mission furniture in the Madison, WI area. Browse other items in the Atria collection from A1 Furniture & Mattress in the Madison, WI area.